Rick Amor studied printmaking in Melbourne in the late 1960s under Murray Walker and Fred Williams, and has produced prints consistently since that time. 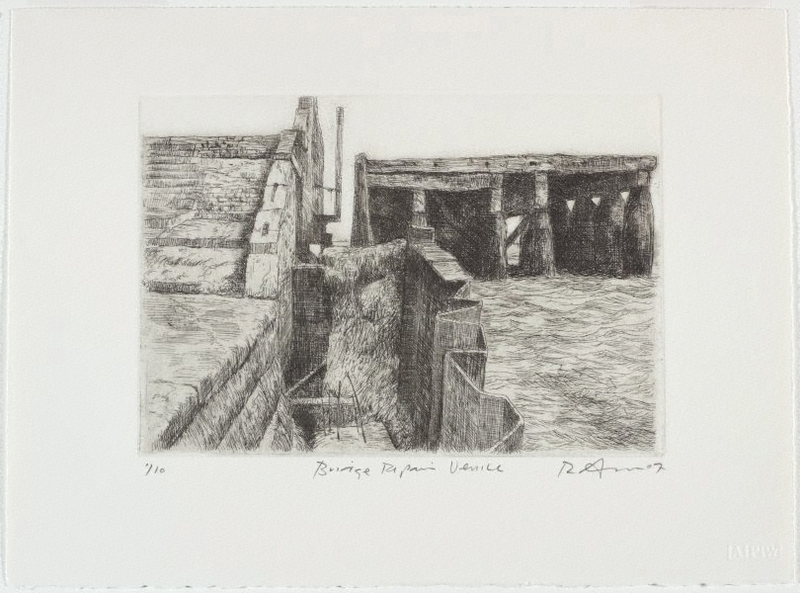 In 2007 Amor participated in a printmaking residency at the Venice Printmaking Workshop, with Jan Senbergs, Jon Cattapan and Louise Weaver; this etching was a product of that experience. Solid architectural forms, piers and structures in/over water are recurring motifs in Amor’s painting; this image of a bridge being repaired in Venice is grounded in a prosaic undertaking - the ongoing maintenance and repair required to keep the lagoon city habitable. However, it simultaneously suggests the metaphysicality of Amor’s greater oeuvre, and reflects his respect for great etchers of the past, such as Whistler, who were also engaged by similar subject matter. Signed and dated l.r., pencil "R Amor 07".